Hoa Binh (VNA) – The northern province of Hoa Binh’s Hoa Binh city was recognised for having fulfilled the new-style rural building mission as said in the Prime Minister’s Decision No.269/QD-TTg dated March 8, 2019. The decision was presented to the provincial People’s Committee on April 7 by Deputy Prime Minister Vuong Dinh Hue, who is also head of the Steering Committee for the National Target Programmes. According to Secretary of the provincial Party Committee Quach Tung Duong, thanks to the engagement of the local political system, all seven communes in the city, namely Dan Chu, Thong Nhat, Su Ngoi, Hoa Binh, Yen Mong, Thai Thinh and Minh Trung, were recognised as new style rural areas after eight years implementing the national target programme on new-style rural area building. During the period, the city worked to mobilise nearly 95 billion VND (4.1 million USD) from local people for the construction of transport system, irrigational system, electricity infrastructure, culture houses and sport zones. It paid due attention to preserving traditional cultural values, and promoting the establishment of cooperative economic models while encouraging businesses to invest in agriculture, especially developing concentrated vegetable planting areas, and seafood cultivating zones. The city was successful with its agricultural restructuring by applying high technologies to improve product quality and value. Besides, various projects were branched out for advanced production development to increase local farmers’ income. Based on each commune’s potential and strengths, specialised growing areas of crops, Lingzhi mushroom, guava and longan, among others, were set up. Currently, the city is home to more than 100 effective economic models, 120 hectares of high-quality rice, 1,000 fish breeding cages, and some 150,000 heads of livestock and poultry. Local income per capita is estimated at 57 million VND (2,450 USD) a year, the rate of poverty household is 1.31 percent, and about 91 percent of rural workers have stable jobs. On the occasion, Chairman of the provincial People’s Committee Nguyen Van Quang presented certificates of merit to 10 organisations and 20 individuals for their excellent contributions to the new-style rural area building programme. 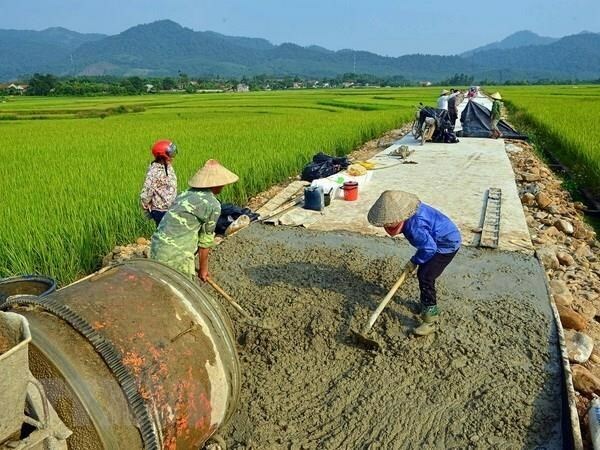 The national target programme on new-style rural area building, launched in 2010, sets 20 criteria aiming to boost the development of rural areas across Vietnam. So far, three localities have had 100 percent of their communes meeting all criteria, namely Nam Dinh Province (193 communes), Dong Nai Province (133 communes) and Da Nang City (11 communes).